Submitted by admin on Thu, 11/15/2007 - 15:37. 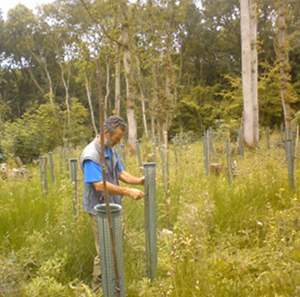 Starting in 2009 we trialled another new approach to truffle cultivation that involves planting saplings within a woodland environment. The trial is a partnership-plantation and now contains 1,100 trees spread across five plots with differing conditions. A lot of time/expertise has gone into the preparation of this trial and updates will be published as the trial progresses. The predictive benefits of this approach include a short time to harvest due to certain conditions found within the woodland. As of the 2014 testing season, growth rates are above those found in field conditions and mycorrhiza establishment is excellent. In total the site contains four host tree species and two truffle species, the summer truffle and spring white truffle. If you have a woodland site and would like to try this approach, please e-mail us for further details.